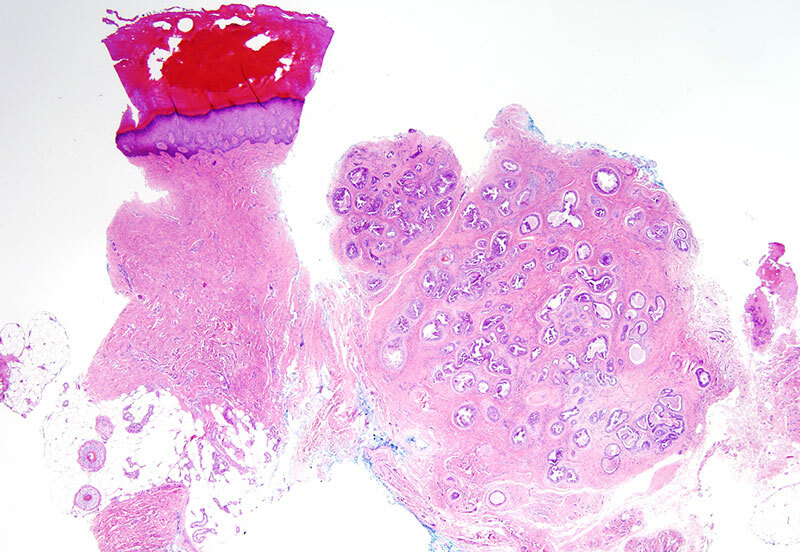 The lesion falls under the general designation of a well differentiated glandular neoplasm exhibiting a papillary architecture and atypia. Overall the morphology and clinical presentation would be most consistent with an aggressive digital papillary adenocarcinoma. The digital papillary carcinoma/papillary adenocarcinoma is a under reported and oftentimes misdiagnosed malignant tumor of the sweat gland located on the digit and toes occurring most commonly in males in their 50's up to 70's. A benign counterpart, namely apocrine hidrocystoma/cystadenoma would be exceedingly rare on the digits. 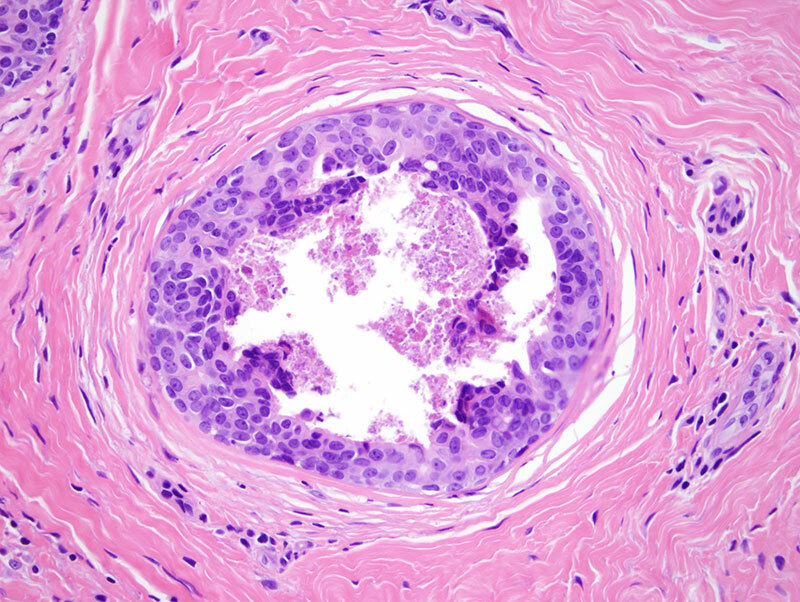 Aggressive papillary digital adenocarcinomas have a high recurrence rate (30 to 40% of cases) and can metastasize (14% of cases). The question arises as to whether or not there is any morphologic distinction between a so called digital adenoma versus an adenocarcinoma. 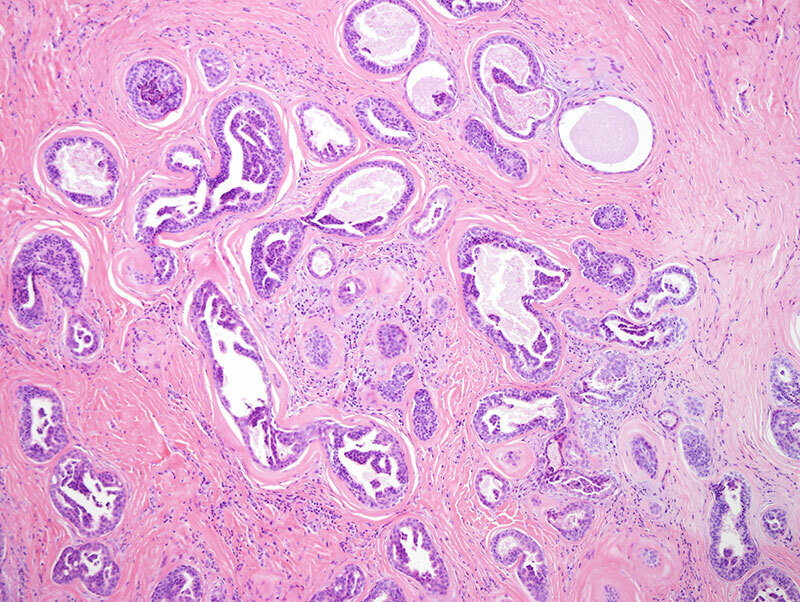 Earlier published work concluded that there were no histomorphologic features that could prognostically differentiate between digital adenoma and digital adenocarcinoma suggesting that all tumors that have this type of histomorphology, namely multiple ductal-glandular foci with endoluminal papillary hyperplasia and variable atypia fall under the general umbrella of aggressive digital papillary adenocarcinoma. 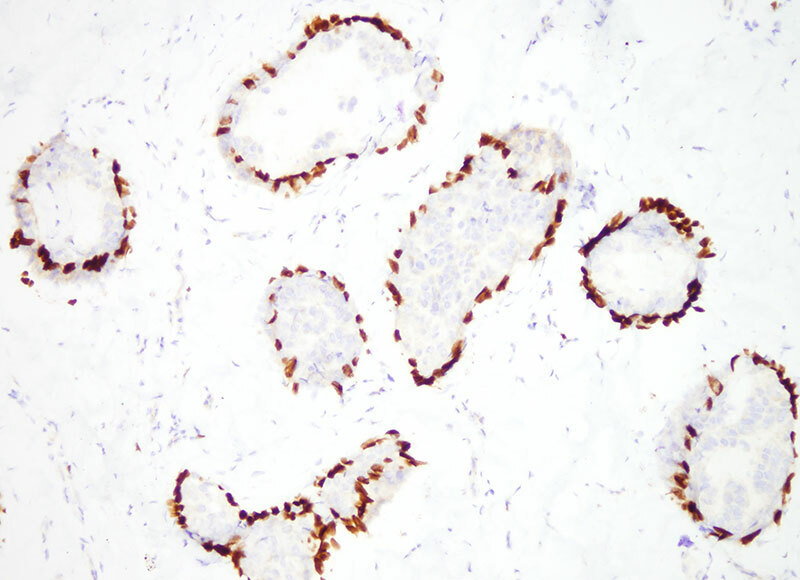 One of the earliest and largest series was published by Grace Kao and coworkers attempted to differentiate between papillary adenoma and aggressive papillary digital adenocarcinoma highlighting poor glandular differentiation, necrosis, cellular atypia, pleomorphism, invasion of soft tissue and bone and blood vessels as being a predictor of the categorization as aggressive digital papillary adenocarcinoma. 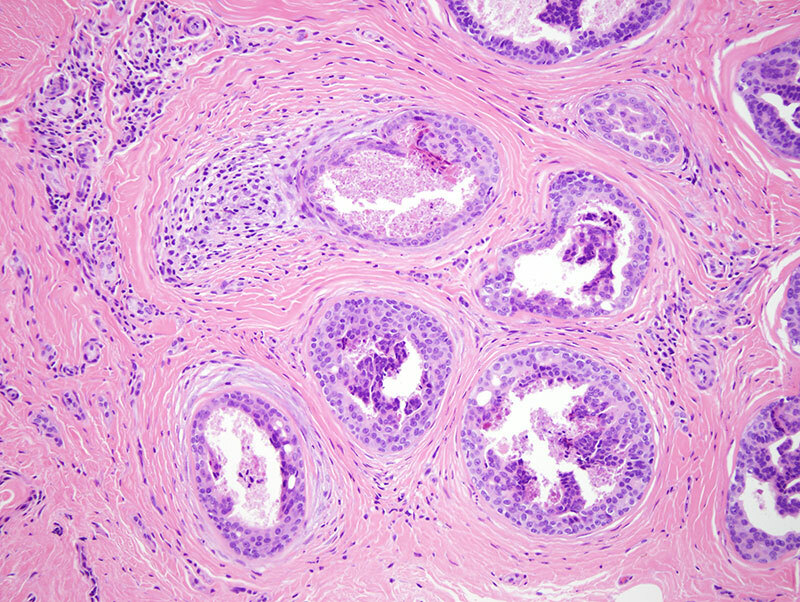 The baseline histology in digital papillary adenoma/ adenocarcinoma are tubular alveolar and ductal structures with areas of papillary projection protruding into lumina with a stroma that varies from thin fibrous septa to areas of dense hyalinized collagen all of which are well exemplified by this case. In this case the degree of necrosis, cellular atypia along with the desmoplastic stromal response with a suggestion of early infiltration of the glandular units into the surrounding stroma would warrant categorization as a aggressive papillary digital adenocarcinoma, really defying categorization as a benign glandular/ductal counterpart. 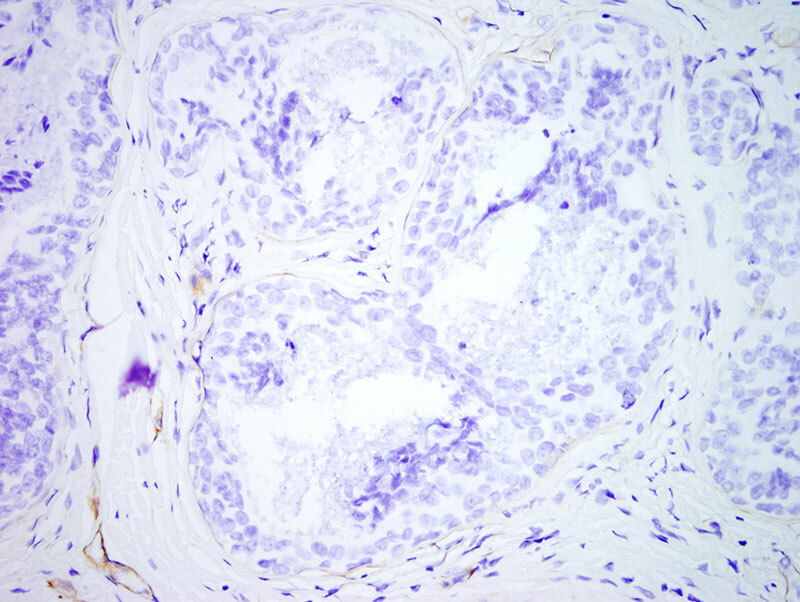 The oncogenic profile driving this rare neoplasm may include BRAF mutations.